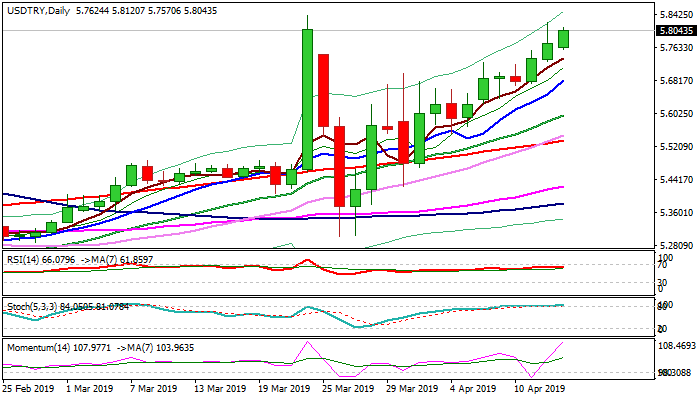 The Turkish lira remains under strong pressure as USDTRY continues to trend higher and look for retes of key short-term resistance at 5.8410 (22 Mar high). Downbeat Turkey's jobs data, released today (unemployment rose to 14.7% in Dec-Feb, hitting the highest in 10 years) add to negative outlook. Slowdown in the economy weighs on lira, with CBRT meeting on 25 Apr being in focus. The lira would likely to stay at the back foot even if the central bank opts for rate cut, as investors' confidence is rapidly fading and change of lira to foreign currencies marks additional pressure. High inflation also frustrates, with further rise expected to be seen on 3 May CPI data release. Bullish techs support scenario, but overbought conditions may slow bulls on approach to 5.8410 pivot. Price adjustment is expected to be shallow in current conditions, with extended dips not to find ground above rising 10SMA (5.6810) before bulls resume. Sustained break above 5.8410 would expose key barriers at 5.8732/67 (weekly cloud top / 3 Jan spike high) and 5.8868 (Fibo 38.2% of 7.1074/5.1323 pullback.